Learn the “How To’s” of sleeping with your doggy when you own one of these colorful and informative sleepers! Artwork is silkscreened on a 100% cotton knit sleep shirt. One size fits most women 6-16. Sleep shirt comes packaged in a matching, 100% cotton drawstring bag (pictured in the detailed images on the lower left). 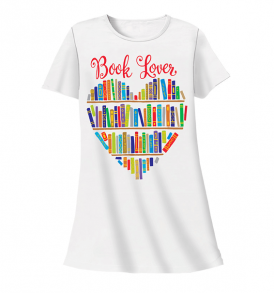 Any “Book Lover” would love, love, love this sleep shirt! Colorful artwork is silkscreened on a 100% cotton sleep shirt. One size fits most. 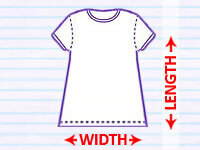 Color: White One size fits most women 6-16. Color: White. Sleep shirt comes packaged in a matching, 100% cotton drawstring bag. Cats are always judging! This sleep shirt is perfect for the cat lover who’s feline friend is always silently judging their every move. Colorful artwork is silkscreened on a 100% cotton sleep shirt. One size fits most women 6-16. Color: Black. 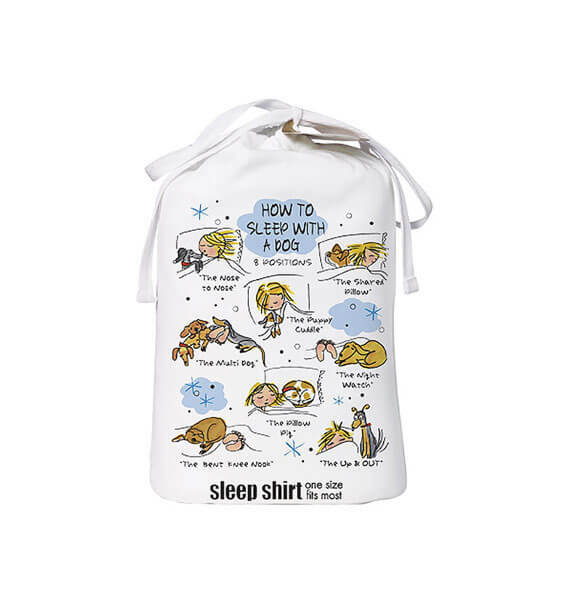 Sleep shirt comes packaged in a matching, 100% cotton drawstring bag. 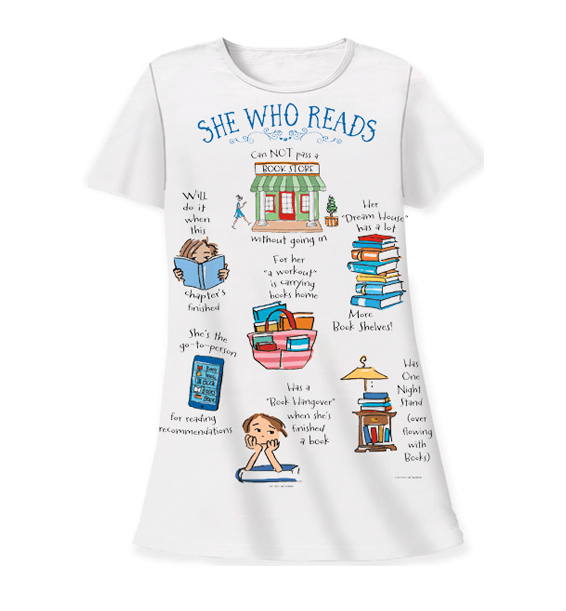 Any “She Who Reads” will love this fun Bookish sleep shirt!! Artwork is silkscreened on a 100% cotton sleep shirt. Own a morning cat? This sleep shirt is perfect for the cat lover who’s feline friend likes to wake up a little too early. Clever and colorful artwork is silkscreened on a 100% cotton Sleep Shirt. One size fits most women 6-16. Color: White. Sleep shirt comes packaged in a matching, 100% cotton drawstring bag (pictured in the detailed images on the lower left). Own a morning dog? 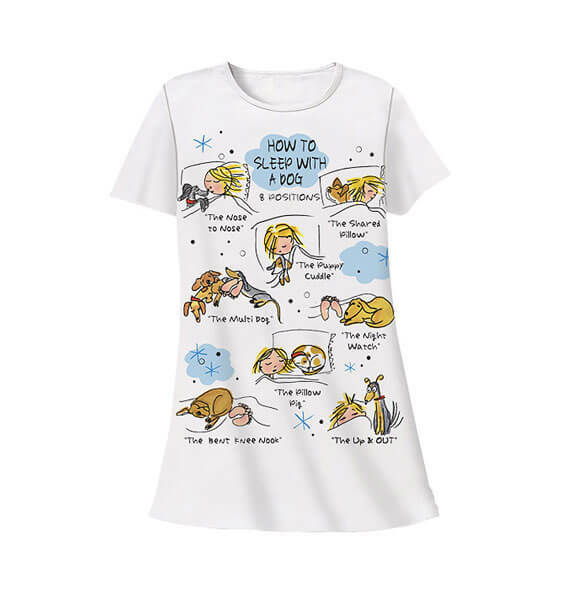 This sleep shirt is perfect for the dog lover who’s canine friend likes to wake up a little too early. Clever and colorful artwork is silkscreened on a 100% cotton Sleep Shirt. One size fits most women 6-16. Color: White. Sleep shirt comes packaged in a matching, 100% cotton drawstring bag (pictured in the detailed images on the lower left). 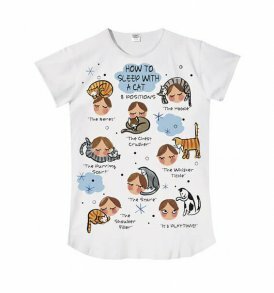 Learn the “How To’s” of sleeping with your kitty when you own one of these colorful and informative sleepers! Artwork is silkscreened on a 100% cotton knit sleep shirt. One size fits most women 6-16. Color: White. Sleep shirt comes packaged in a matching, 100% cotton drawstring bag (pictured in the detailed images on the lower left).